Nishtar S, Gluckman P, Armstrong T. Ending childhood obesity: a time for action. Lancet 2016 Jan 22. pii: S0140-6736(16)00140-9. doi: 10.1016/S0140-6736(16)00140-9. NCD Risk Factor Collaboration (NCD-RisC).A century of trends in adult human height. 2016 Jul 26;5. pii: e13410. doi: 10.7554/eLife.13410. NCD Risk Factor Collaboration (NCD-RisC). Worldwide trends in blood pressure from 1975 to 2015: a pooled analysis of 1479 population-based measurement studies with 19·1 million participants. 2017 Jan 7;389(10064):37-55. doi: 10.1016/S0140-6736(16)31919-5. Epub 2016 Nov 16. Nishtar S. Will you support a patient-centred R&D agreement? Nishtar S. Will you support a patient-centred R&D agreement? Response from Sania Nishtar, WHO DG candidate. Lancet Glob Health. 2017 Mar;5(3):e263. doi: 10.1016/S2214-109X(17)30026-8. Epub 2017 Jan 19. Nishtar S. Open letter to WHO DG candidates: reply from Sania Nishtar. 2017 May 20;389(10083):1978-1979. doi: 10.1016/S0140-6736(17)31254-0. Epub 2017 May 9. Nishtar S. Opinion: A new deal for health. Devex May 2, 2017. July 13, 2017: Dr. Sania Nishtar was the closing keynote speaker at the 2nd Global Summit on Circulatory Health held in Singapore this week. The meeting was hosted by the World Heart Federation. Sania Nishtar spoke about her recent experience as nominee for WHO Director General and drew on her insights after having met with ministers of health and high-level delegations from over 190 countries. She dilated on the need for mainstreaming NCD prevention and control in country health systems planning and elaborated on the huge need to do so, which was highlighted during her interactions with country delegations. May 23, 2017: After an intensive 18 month election campaign for the position of WHO Director General, Dr Sania Nishtar was defeated by Tedros Adanhom of Ethiopia in the final election which was held at the World Health Assembly on May 23rd, 2017. 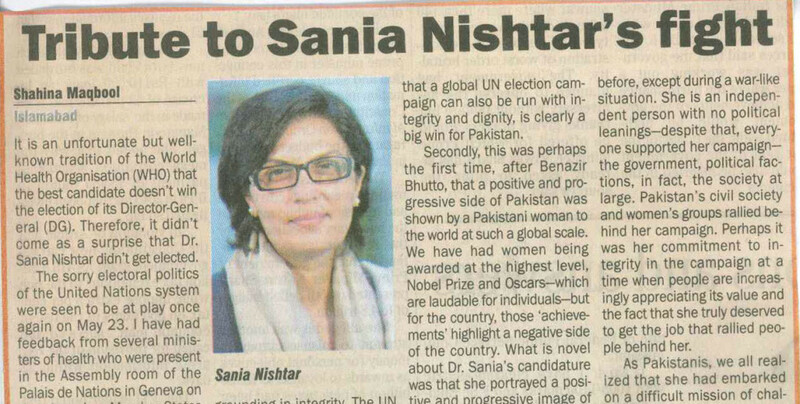 In a dignified final campaign newsletter, Sania Nishtar accepts defeat gracefully. She conveys here deepest gratitude to all those who supported her, wished the new WHO DG all the best and referred to her candidacy and her nomination as an “extraordinary privilege”. 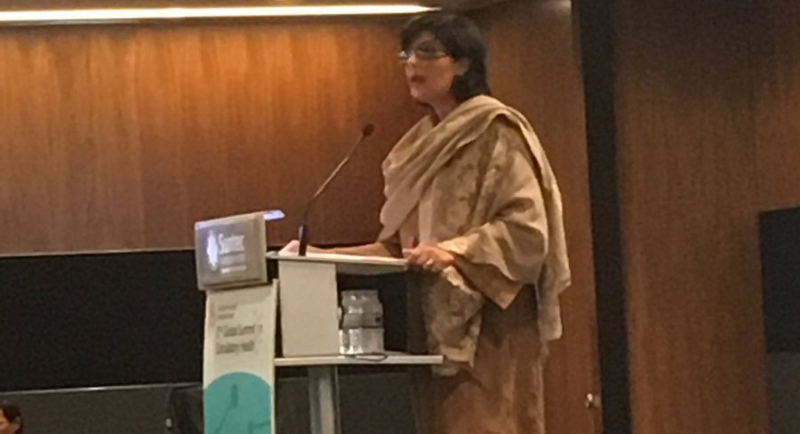 Sania Nishtar draws attention to her efforts aimed at having initialized an international movement for change in drawing attention to some of the root causes facing the UN system as outlined in her final Op-Ed in the campaign and reiterated in her final speech at the World Health Assembly. She also recalled her efforts to promote “new deal” for WHO, one where she envisaged institutionalizing transparency and accountability as central tenets to delivering institutional reform, and hoped that these efforts would help catalyze a movement within WHO.